Sure, you can go to oyster bars all over town and knock back a dozen oysters on the half-shell, eat clams and mussels steamed at restaurants everywhere and bake yourself some fresh berry shortcake at home. 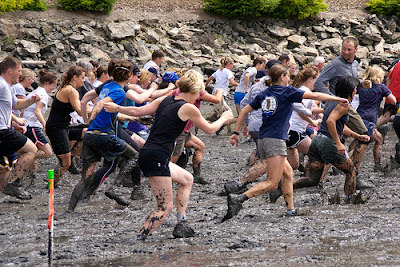 But when it comes eating all of the above — and then some — there’s no better place to do so than the annual Samish Bay Bivalve Bash and Low-Tide Mud Run, set for Saturday July 25 at Taylor Shellfish Farms in beautiful Bow, Washington. Trust me: you can get mighty hungry and work up a mean thirst after watching hundreds of runners get stuck in the muck on the Samish Bay mudflats (wanna run? quick! register here). And speaking of geoducks, be sure to stop by and say hi to Xinh Dwelley, who’s making her famous curried mussels again this year, though you’ll have to go to her restaurant, in Shelton, to taste her geoduck. Watch Xinh get “goo-ey” on TV. It’s a Dirty Job, but someone’s got to do it. Your $5 entrance fee (kids 6 free) and cost of food and beverage benefit the clean water efforts of the Skagit Conservation Education Alliance. Consider it money well-spent for a day-long festival of food and fun.